April 1986. The Cold War is nearly over. Wealthy business mogul Tobias Keane is dead in an apparent suicide. Ethan Tannor, a detective on the scene and nephew of Keane, suspects something else. In his effort to prove his uncle was murdered, Ethan discovers there was more to Tobias’s past than he initially thought. All roads point to an impending hostile takeover of the United States as Ethan finds himself in the center of something he can’t explain. Political agendas headed by a shadowy leader, and an evil force tipping the balance of power bring him face to face with things beyond the realm of belief and possibility. When the lines of reality and fiction become blurred, Ethan embarks on the near impossible task of reshaping the world. If he fails, the battleground will be America, with new territory lines carved across the map as the victor stakes their claim. But Ethan is determined to end it where it all began: April 1986. 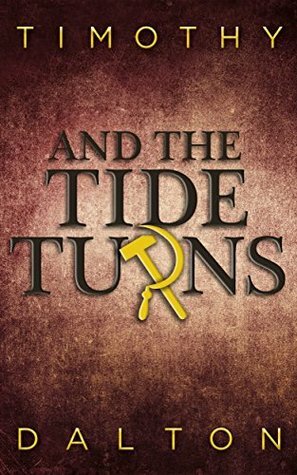 And the Tide Turns is Timothy Dalton’s debut novel – an action-packed thriller that will leave readers guessing as they journey with Ethan Tannor in his quest to figure out the secret behind his uncle’s death … a quest that brings him to places he never imagined, and the discovery of his uncle’s strange connection to the unsolved mystery of The Somerton Man.Artwork by Matthew Dalton. Be sure to stay tuned for Timothy’s upcoming new novel, On the Hitlist(Working Title), which should be released in the coming months. This book did a good job pulling me into the story. It was a fun read, with enough violence and chaos to make this crazy girl happy. The little pictures in each chapter was icing on the cake. It's definitely one of those books that you have to pay attention to whats happening at all times. It can be very, very easy to get lost if you don't. I got lost a couple of times myself but was able to get back on track quickly. I'm not a fan of cop-like books anymore. They were fun at first but they are all starting to blend in for me. I didn't let that ruin this book for me because it's not Timothy Dalton's fault I'm tired of cop books. I'm actually very impressed with Dalton's ability to keep everything together. And that everything came together at the end so smoothly. This is going to be a short review because I don't have much to say about the book and I don't want to spoil it. It's a great read that starts off strong and I think everyone could enjoy it.